Washington Square Park is among the handful of parks in San Francisco that you don't have to climb a huge hill to visit. That and its proximity to Sts. Peter and Paul Church help lend the park a feeling of a European town square. 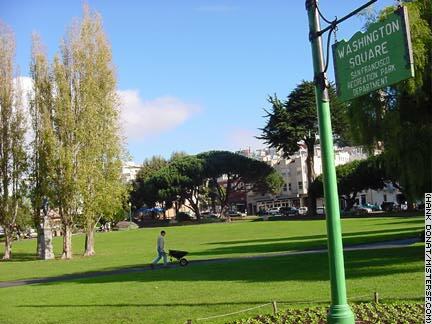 With its sunny location in the heart of North Beach, Washington Square Park is a beautiful place for picnics, Tai Chi, strolling, or people watching. The most essential detail about Washington Square Park is that it is the only one of the City's three original parks that hasn't been raised off the ground to become the roof of a parking garage. Union Square and Portsmouth Square are the two that have been so altered. The park named for George Washington has a statue of Benjamin Franklin in the center. Another statute features volunteer firemen and was given to the City by Lillie Hitchcock Coit, the fire fighting enthusiast whose 1929 bequeathal to the City was used to build nearby Coit Tower.